Hands down, the easiest way to get your eVisa for Kenya is with iVisa. For those of you who aren’t familiar, iVisa is a service providing expedited processing for visa applications. Wether you want to safari Nairobi National Park or summit Mount Kenya, you will probably need a Kenya eVisa. 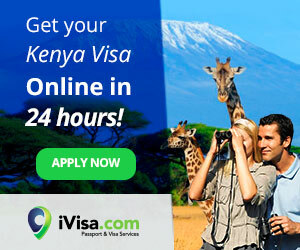 Read on below to find out how to easily get your Kenya visa online with iVisa. As you probably know, Kenya is a country in East Africa that boarders the Indian Ocean. While the vast majority of countries need a visa to enter Kenya, some African countries and other island nations such as Saint Lucia, Jamaica, and Fiji are exempt. You can check to see if you need a visa to travel to Kenya by using iVisa’s online visa lookup tool. A Kenya visa for US citizens is required. Assuming that you need a visa to enter Kenya, it’s actually quite easy to apply for a Kenyan visa. Rather than going through the Republic of Kenya’s government website and filling out a Kenya visa application, iVisa will submit the necessary paperwork and documentation to the Kenyan government on your behalf and email you your Kenya eVisa. All you have to do is input your passport information, anticipated travel dates, and port of arrival. Then, depending on how quickly you need it, you can choose to get your Kenya eVisa as soon as 24 hours from now. The following table shows the price and processing time for a single entry Kenya eVisa that's valid for 90 days of travel. All prices are in United States dollars. While I submitted my iVisa application with standard processing on a Friday, my eVisa was in my inbox on Monday, just three days later. Consequently, it seems like processing times are maximums. So unless you’re pressed for time, standard processing is probably sufficient. It’s worth pointing out that your passport cannot expire within six months from your planned date of entry. In addition, your passport should have at least one blank page. Once issued, your Kenya tourist visa will be valid for up to thee months before your travel. Upon entering Kenya, your stay must not exceed 90 days. As soon as you leave Kenya, your visa expires and you will need to apply for a renewed visa. By now, you have all the information that you need to get a Kenya visa. Let iVisa submit your Kenya visa application and have your visa delivered to you by email as soon as tomorrow. As an iVisa customer myself, let me know if you have any questions about the Kenya eVisa application process below. I’ll be more than happy to help you out.